Your home should be a slice of paradise. Perhaps that's why everyone is obsessed with the tropical trend. Wondering how to turn your living room into a vacation-worthy oasis? Get inspired with these 'grammable spaces that exude equatorial flair. 1. Try an exotic tapestry. 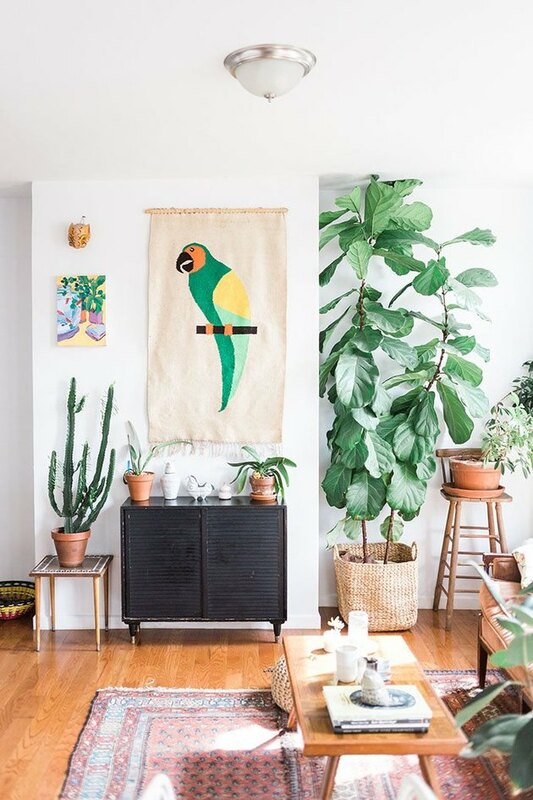 Illustrator Leah Goren's eclectic New York abode beautifully blends boho and exotic. Midcentury furnishings, lots of natural light, and verdant foliage — like the fiddle-leaf fig that sits in this woven basket ( starting at $24.99 ) — round out the room. But it's her grandmother's parrot tapestry that's the total showstopper. If you ask us, a gallery wall is always a good idea! An assortment of watercolor prints is star of this space, while potted plants and peach accents enhance the ultra-chic aesthetic. 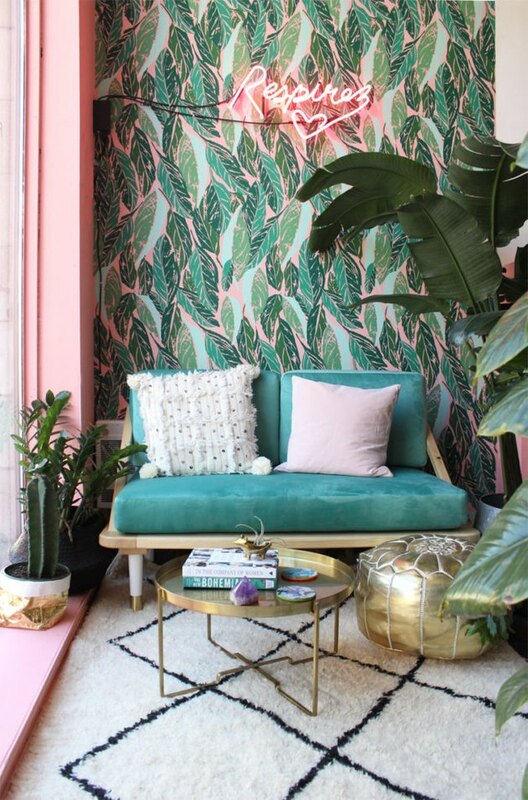 Tropical wallpaper — one of the top home trends, according to Pinterest — is a quick and easy way to give any room a fierce update. Opt for vibrant prints like palm trees and banana leaves. Pair with sleek furnishings and this geometric area rug to keep the look contemporary, not kitschy. 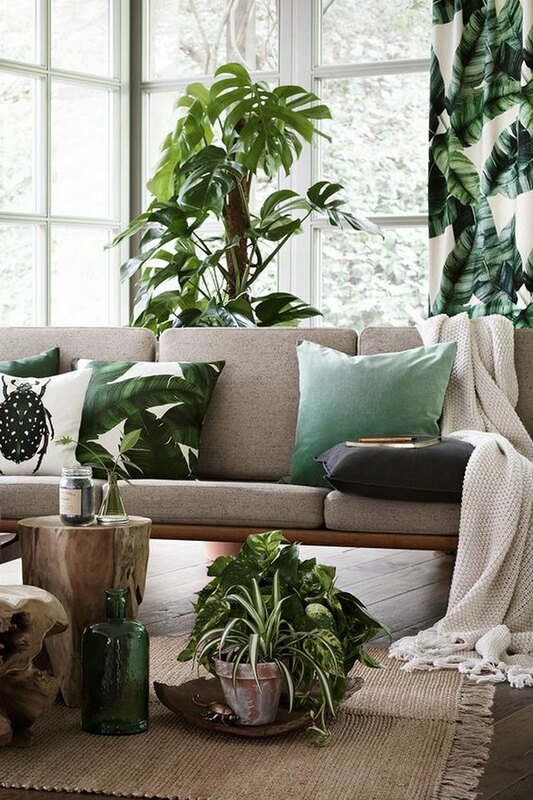 Drawing inspiration from nature, this stunning space marries raw wood and lush plants with banana leaf pillows ( $12.99 ) and drapes. And the end result is beautifully organic yet refined. 5. Get graphic. Mix and match patterns. 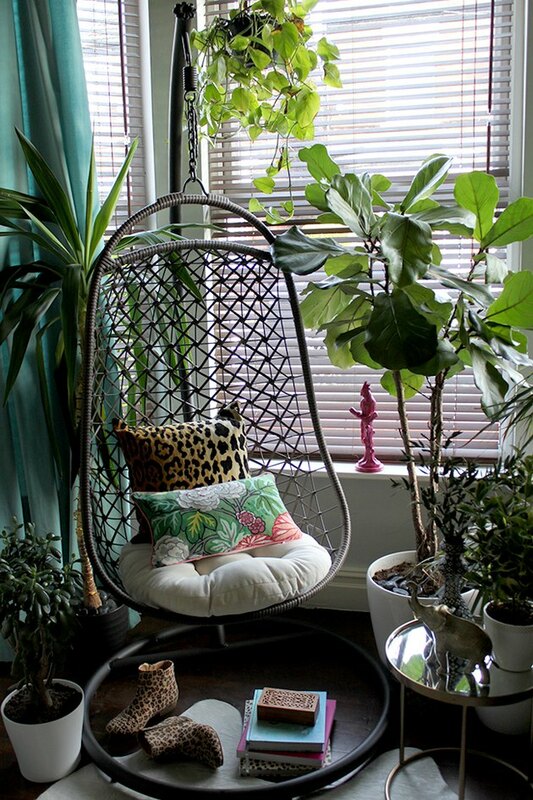 Kimberly from Swoon Worthy created her own little jungle oasis by surrounding this hanging egg chair with beautiful verdant foliage. On its own, the woven chair might get lost amidst all the plant life, but when styled with a mix of colorful and graphic pillows ( starting at $54 ), it really wows! When Dabito from Old Brand New partners with Justina from the Jungalow, watch out: Magic is about to happen. 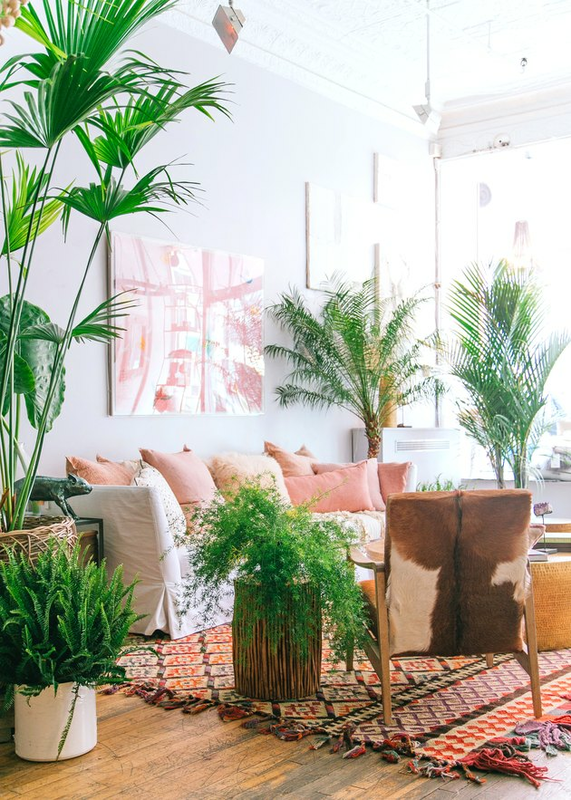 They transformed this space into a tropical lounge with tons of personality. Among our favorite elements are all of the rosy pink accents. 7. Or take a more minimal approach. The atmosphere in Shaynah Dodge's living room is modern and minimal, but far from bare. 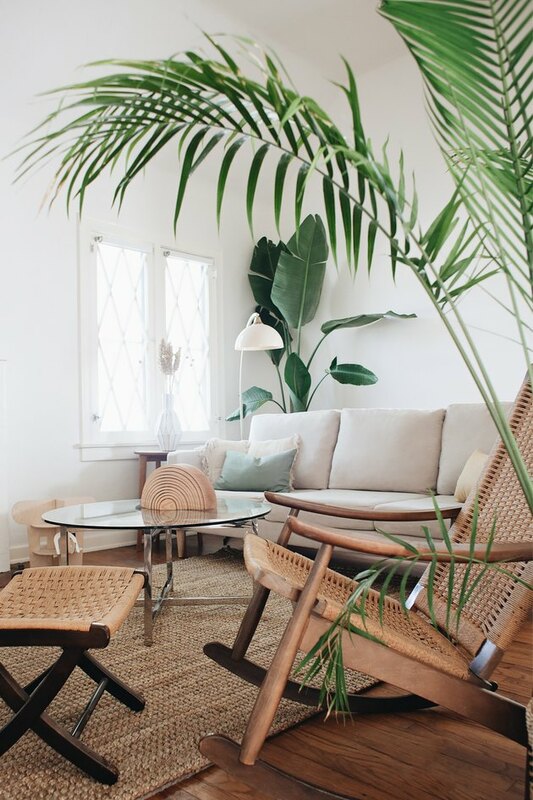 A few distinctive elements — leafy greenery, a lounge chair with fur throw, and leather sofa — add tons of vacation-worthy style. 8. Plants, plants, and more plants. 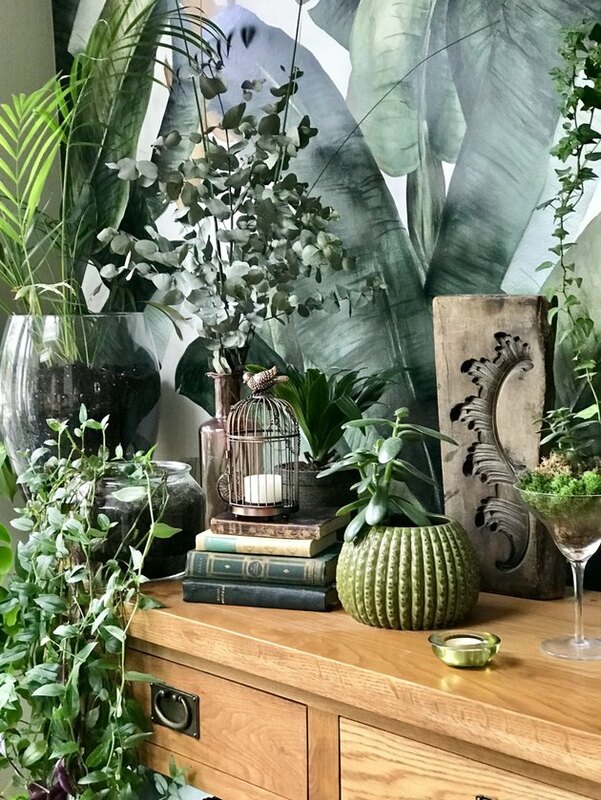 How amazing is this tropical retreat by Maria from The Interior Editor? 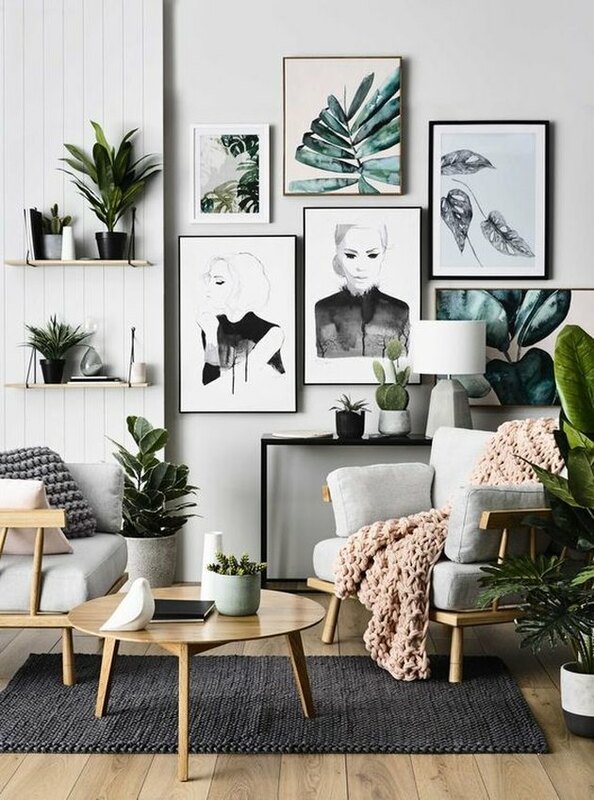 She created the perfect backdrop for her stunning collection of greenery thanks to this large scale banana leaf wall mural that instantly transports you to the tropics. Want to enliven your living room? 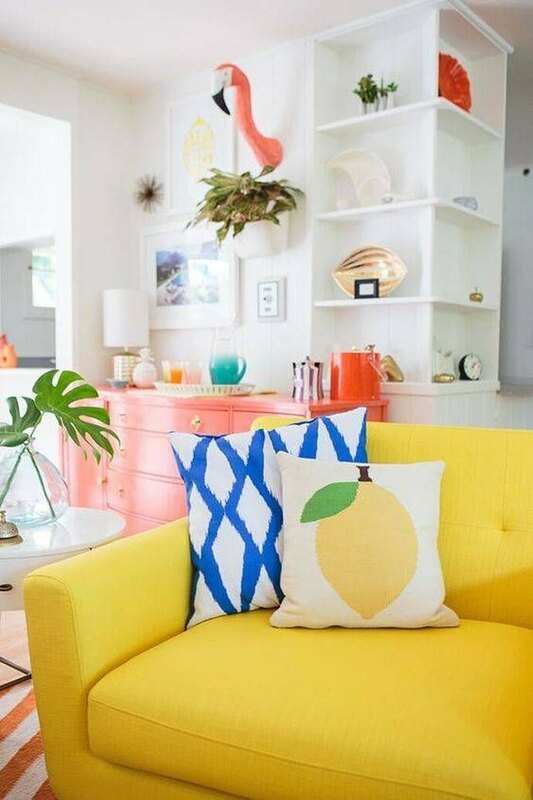 Punch up the color with citrus yellow lounge chairs , plus pops of pink and turquoise like author and creative director Mrs. Lilien. You can't possibly have a bad day when your dwelling is this cheerful and you have a pink flamingo hanging from your wall. 10. Or keep it neutral. 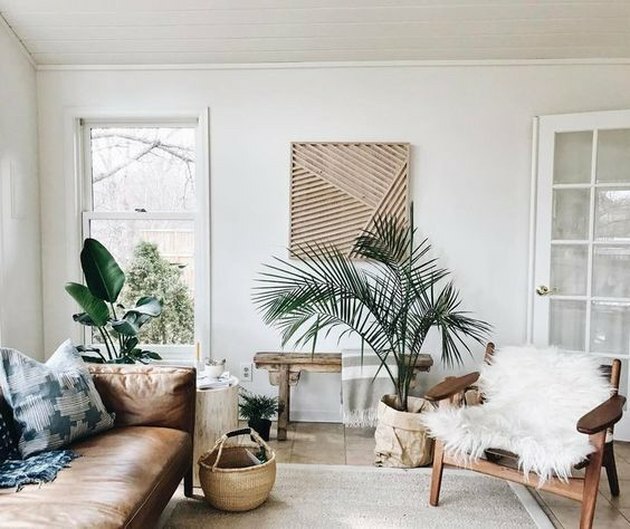 Neutral pieces and natural materials (wood, glass, metal, and natural fibers) lay the foundation in Erin from Calivintage's tropical living room. Ornamental plants and global treasure lend a well-traveled zeal. And the effect is free-spirited and oh-so-soothing. 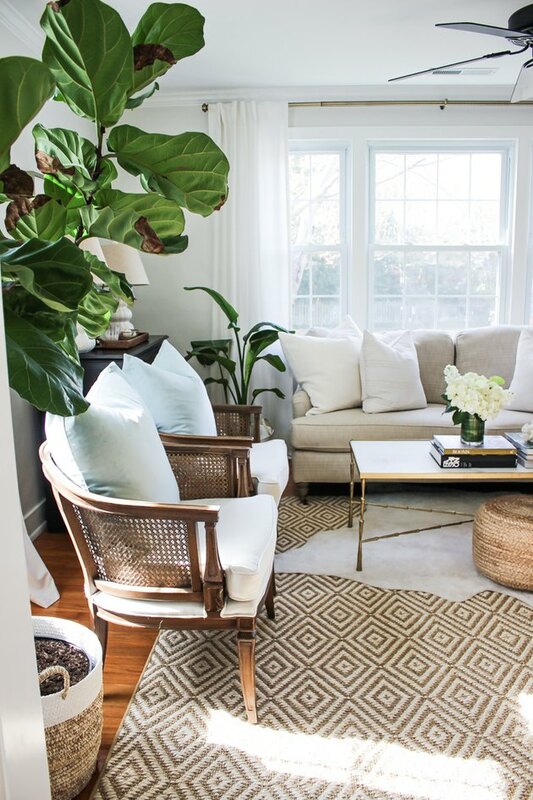 This living room belonging to Megan from Holy City Chic is filled with so many gorgeous textures. The rattan lounge chairs, sheer drapery, and ceiling fan imbue island vibes, while the elegant sofa and coffee table add a sense of sophistication.